NYC Pride is proud to introduce the next evolution of the legendary Dance on the Pier, a new 3-day LGBT cultural experience: Pride Island. From legendary soul singers to indie pop bands, this new inclusive experience creates a central hub for the LGBT community to celebrate Pride. Friday night will be the first night of three day event. We are bringing you the soul classics with some of the most well known female acts of all time. On Friday, multi-platinum selling singer-songwriter Deborah Cox will croon her classic R&B tunes that include "Nobody's Supposed to Be Here" while DJ Lina spins on the 1s and 2s. Finishing the evening, Patti Labelle hits a high note with her powerful vocals and timeless hits such as "On My Own," "If Only You Knew," and "Lady Marmalade." Saturday's lineup includes the sultry Grammy-nominated "Closer" duo Tegan and Sara and British electronica "King" trio Years & Years. Rounding out the day of new age sounds are Roisin Murphy, Gallant, Dimitri From Paris, and Occupy The Disco. 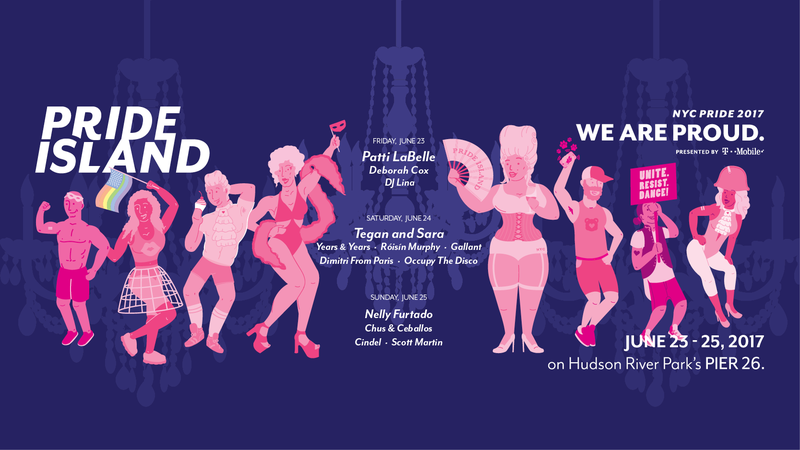 Sunday's lineup will bring the essence of what one can expect from a NYC Pride closing event on Pier 26. Rising star DJ Scott Martin will open the space and provide daytime house music. Next, DJ Cindel and his legendary house beats will continue to energize the crowd. Finally, what will likely be one of the largest DJ duos to ever spin Pier 26, Chus & Ceballlos will close the evening. The chart-topping, Grammy Award-winning singer and songwriter, Nelly Furtado, touches down to headline Sunday’s Pride Island on June 25, 2017. Gaining steam in the year 2000 with her debut album, Whoa, Nelly!, the Portuguese-Canadian singer hasn’t slowed down since. Furtado’s spell-bounding solo hits such as “I’m like a Bird,” “Turn off the Light” and “Say It Right” are impressed in the history of pop music. Her collaborative pop smashes with Timbaland for “Promiscuous” and “Give It to Me” featuring Justin Timberlake, will move the crowd for Sunday’s dynamic closing. Don't miss the biggest live music event in NYC Pride history and help us give back to the broader community! NYC Pride will be selecting non-profits within the local New York City area to receive grants as part of this community driven event. Pride Island serves as a fundraiser to help NYC Pride raise crucial funds to help produce a multitude of free events such as our new Youth Carnival, Family Movie Night, PrideFest, The March, The Rally and many more! VIP includes VIP admission to the event, plus express entry to skip the lines, complimentary Reyka Vodka, Milagro Tequila and Sailor Jerry Rum cocktails, Bud Light and wine, an elevated VIP area, and private restrooms. Ultra Premium Cabana includes a private seated area overlooking the crowd across from the stage. This is the premium VIP experience at Pride Island. It includes a private seating area, six (6) VIP tickets, one bottle of Reyka Vodka, Milagro Tequila, or Sailor Jerry Rum, your own bottle service attendant, mixers, and fruit. Even though some Drink Ticket add on's are now sold out, you will still be able to purchase drink tickets at the event. To apply for community grants, click here. To volunteer for Pride Island, click here. There is a strict NO BAG policy enforced by NYPD. To avoid headaches, we advise you to leave your bags at home. Pier 26 West St. at N. Moore St.